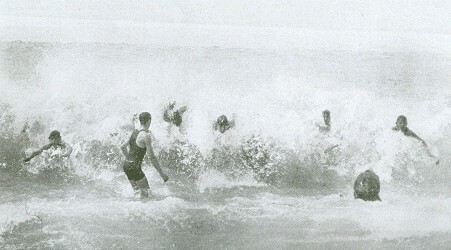 H. F. Alexander : Water Sports of the South Sea Islands, 1911. Alexander, H. F.: Water Sports of the South Sea Islands. Volume 1, Number 6, June,1911, pages 653 to 663. 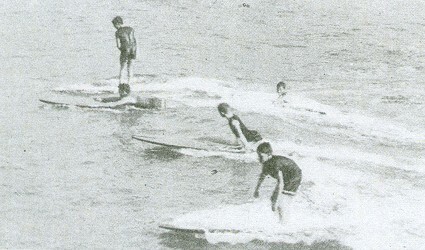 While some of the "water sports" detailed by Alexander may be today considered unsuitable, for example shark hunting and turtle riding, his extended comments on surfboard riding in Fiji, pages 655 to 659, are of most interest. Also note the account of rock sliding on Taviuni, Fiji, and Papasaia in Samoa, pages 559 to 661. This activity, along with high diving or jumping, is documented in several accounts from the Hawaiian Islands and was probably widespread across the Pacific islands. 1876 Mrs. Brassey : Surfriding at Hilo. 1882 Walter Coote : Cliff Jumping, Hilo. 1886 Walter M. Leman : Cliff Jumping, Hilo. I was talking with an old resident in Samoa, who had been asked to write an article on the sports of that island. "Absolutely im possible for me to do it," he explained; "there are no sports down here." A little later he was showIng me how to ride turtles in their native element! No sports in the South Seas! There's a world of them - from hunting the wild pig ashore (and sometimes there are fatal accidents) to riding turtles and catching - or being caught by - sharks in the sea. I spent many months cruising from island to island in the Pacific, and every day some new sport was proposed to me by men who were astonished that I had never before heard of such a thing. I was lucky enough to be invited to attend a palolo expedition - as soon as the third quarter of the moon came round - for on two days, and two days only, out of every year the palolo makes his apearance in the South Seas. If you wish to enjoy the sport of palolo fishing, you must be in Fiji or Samoa during Octqber and November. If at the third quarter of the moon in October, just before dawn, the palolo rises in small numbers, the native knows that the big catch will be in November; if in large numbers, he need not bother about the November catch at all; so it is safest to arrive in these islands about the middle of October, if you are a palolo enthusiast, and palolo fishing is certainly one of the rarest sports in the world, confined to two groups of islands, two days at most out of each year. There is one reef near Apia where the palolo is known to rise in vast numbers. When October comes, every one watches the moon; on the night that it enters its third quarter, every man, woman and child, white and native, who can beg, borrow or steal a canoe or craft of any kind, makes for the reef. Patiently the fleet waits, watching the outer edge of the reef where the swells of the ocean break into foam. 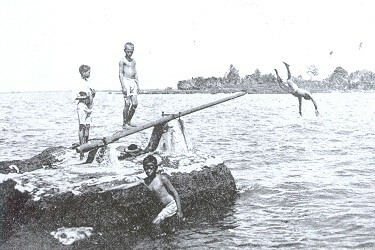 Maori Children Diving for Pennies, Rotorua. ... ing the waters; in every boat is a scoup of mosquito netting for each occupant; an hour passes and a few string-like worms of greenish color, some eight or ten inches in length, float up to the surface of the sea. Now the excitement becomes intense - this greenish sea worm is the palolo, that lives for 364 days in the coral; if he begins to come up in large numbers, there is a great cheering, and the nets are gotten in readiness; if the numbers are few, there is disappointment and many paddle to shore, knowing that the great catch will be four weeks later to the day, hour and minute. But on the day of the great catch! About 3 a. m. a huge sea serpent seems to rise from the sea and stretch its length just above the irregular edge of the coral bank - a green and yellow writhing gelatine-looking mass floats upon the sea - everywhere now the spaghetti-like palolo is rising to the surface - sharks and every kind of fish are swarming to the reef to enjoy their one great annual banquet. The occupants of the canoes do not heed the fish, and the fish ignore them - it is palolo day - or to be accurate palolo hour, for at dawn these shiny strings of life will sink again to their holes in the coral - or as the sun rises, melt away and disappear in the briefest space of time. With shrieking and laughter the scoops and nets are dipped into the sea and lifted up laden with shiny writhing palolo; as fast as the fishers call ply their arms and nets the lucious sea worms are bailed into the boat, until she sinks in the sea to her gunwales, and as the great serpent-like line of green and yellow slime begills to dissolve before the rising sun, the fleet, heavy laden with the spoil, returns to Apia, where an army of helpers is ready with pails, buckets, old oil cans and every kind of receptacle to carry home a portion of the catch. The children are hurried into the fields to pick taro leaves, and soon fires are burning in every house and native hut in Samoa. ... strings keeping in this condition for one full year - it being the custom the day of the big catch to eat the last parcel of the catch of the year before - thus insuring, according to Samoan tradition, a big "rising" for the next coming of the palolo. Personally, I prefer palolo to octopus, both of which I have dined on with my native friends in Samoa. Another sport upon the reefs that took my fancy was crayfishing. The crayfish - as large and luscious as lobsters - live down below the jutting edge of the outer reef. The natives, who have acquired the difficult art, visit the reef at low tide, stand upon its edge, and as the wave recedes, dive down, swim beneath the ledge and look for the crayfish upon the wall of coral. Although the water upon the reef may be but a few inches deep, beyond its edge there is a drop of hundreds of fathoms. Here the rollers that have started near the coast of South America, meet their first obstacle, and there is a constant roar of the breaking surf. Let anyone get caught in this and he is apt to be pounded to death against the coral barrier, or if not, the back wash may force him beneath the shelving fornlation, and keep him there until drowned. It was in this way that hundreds of sailors lost their lives during the great hurricane that made Apia historic. There are native men and women, however, in these South Sea Islands who have learned to dive beneath this self of rock; they wait for the psychological moment, drop over the edge, secure the crayfish, rise again just as the wave has spent its force, and land in safety. Usually these divers wear goggles that fit closely and keep the water out of the eyes, for they must keep their eyes open to look for the crayfish, and then watch the crest of the wave above that they may know just when to rise, for it is a dangerous sport, this crayfishing in the South Sea Islands. Learning to Swim in Honolulu. ... from the wreck, or riding in on a surf-board with the thrilling, blood-curdling knowledge that there are sharks about. I had learned to ride the surf-board in Hawaii, and everywhere while cruising among the Fiji Islands I was on the lookout for native surfers. No one had ever heard of surfboard riders in Fiji - everyone ridiculed the idea, save one old settler I met on the cruise. He had lived among the natives for years, sharing in their life and sports. "On the Island of Taviuni," he said, "you will find natives who ride the surfboard; it is the accomplishment of a little village called Korovu, near the end of the island ,where it joins the reef." I made for Taviuni, but no one on the island, not even those who had lived there for years and decades, knew of any natives who rode upon the surf; in fact, my claim was ridiculed; but I had seen the great rolling surf at Korovu as we sailed past, and had made up my mind to have a closer acquaintance. Two of the planters were desirous of seeing how the thing was done, so provided horses and we rode away. At the little native village we were met by the Buli, or Iocal chief, "Yes, his people did ride the surf, but the men who were best at it were away gathering copra for the trawlers, but if the gentlemen wished it, he would order some of the women and old men into the sea." We did wish it, and soon I was scurrying about seeking a surf-board. Alas! 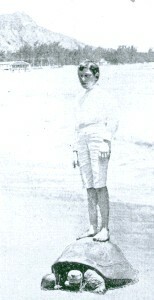 to my disappointment, I found that the Fijians, unlike the Hawaiins, use any scrap of timber as a board for surfing; moreover, they never stand upon their boards, which are usually but two or three feet in length, being content to merely rest their chests upon them and come sweeping in before the waves in a prostrate position. However, I succeeded in finding a piece of an old canoe, some seven feet in length, and determined to make an attempt that if successful would, I was certain, astonish the natives. We started for the surfing place. Sliding Down the Face of a Hawaiian Waterfall. ... was nothing like Waikiki Beach near Honolulu. Instead of the great broad beach, we approached a high, rocky cliff - cleft in twain by some seismatic disturbance - into this narrow cleft not ten feet wide the rollers that passed over the reef, swept with terrific force. The natives first threw their little planks into the sea, and then dived down through the forty feet of space that separated the beetling edge of the rocky cliff from the surging waters. of breakers at the edge of the reef. I threw myself flat upon my board, and my arms working round like windmills sent me speeding through the waves - to the wild delight of the admiring audience above, and the astonishment of the surfriders themselves, who were not accustomed to the Hawaiian method. One old Fijian seemed to know the currents and tried to explain to me, but I soon discovered for myself that I had not Hawaiian waters to deal with. The rollers rushed over the reef at an angle that created a swirl, so that once out of the direct shoreward current there was a mill race to the sea. I was soon in the mill race. In vain I turned my board to stem the current, I was powerless. The old Fijian motioned me back, intimating that sharks abounded beyond the reef, in deep water. 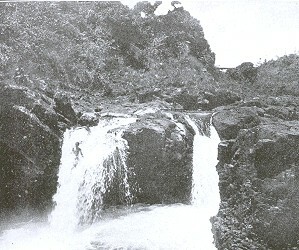 The Papasea Fall Leap, Somoa. ... ing me not only backward over the edge of the reef, but downward, for a Niagara poured over the reef with each receding wave. I leaped from my board and stood upon my feet almost on the edge of the reef, the backward swirl caught me in its grasp and bore me down, tearing my feet upon the sharp coral. I went under, still holding to my board. I knew the dangers of that shelf of coral beneath which strange currents roll - I knew that the nearer to the surface the weaker the undertow, and I tried once more to mount my board. An incoming wave relieved the fearful tension on the lower part of my body, and almost exhausted I once more lay flat upon my plank. Again the waves receded, and I was carried far beyond the reef into deep water. daring or offering to come to my asistance - they knew and fearedthe sharks that haunt the deeper waters. Even to attempt to paddle against the receeding waves I knew to be useless folly, yet my a!ms revolved in that powerful exhaustive windmill stroke, when they should have been resting for a supreme effort. At last the longed for roller came, lifted me on its crest, my weary arms refused to give the few great strong strokes and I sank behind further from the reef than ever. Moreover my board, the part of a canoe, was rounded, my body rested in a hollow, and I doubted if with this curved vehicle I could ever catch and hold a wave. Now I rested exhausted - another and another wave passed me by- and then a still larger approaching I prepared for a supreme effort. I caught it and went sailing toward the reef, but alas the Fijian rollers break quickly and give out a short run. I guided my board, by swinging my legs to the left, toward the old Fijian, who standing on the edge of the reef, where the current set inward, held out his hand toward me - my wave gave out just before I reached him and I felt my board slipping back. Madly I struggled now, for I did not dare hope to struggle successfully with another current; once the tips of my outstretched fingers reached those of the old Fijian, - then slipped- he bent forward, seized my board and drew me in exhausted and I lay panting for some time before I was able to get upon my feet in the shallow water. The danger was over and laughing brown men and women now shot by me, their little bits of board held before them or their chests lightly resting on the wood. ... guiding my board - by a mere motion of the foot between the cliffs - alas for human vanity! I thought I had at last caught my wave, sprang to my feet, my apology for a surfboard dived and I was thrown into two feet of water and dragged over the coral that cut and tore the skin wherever the jagged edges touched. It was torture; in pain and bleeding I once more clambered upon my board, while roller after roller hurried me forward to the iron-bound shore. Men and women on the sky line above called to me in a strange language; men and women about me to whom coral was nothing, urged me to wade fearing that I might be dashed against the rocks, but I seized the right wavelet and with a swish and a roar glided into the narrow tortuous cleft between the high rocky cliffs, leaped from my board as the backwash bore it away, and with the next inrush of the water, gave myself to the current unresistingly and glided over smooth stones to a ledge of rock, where I was gently deposited, and from which I climbed to the heights above - a wiser man as to surfboarding in Fijian waters - the first and only white person, most probably, that has ever attempted this sport with the natives of Fiji. I would not advise anyone to follow my example - there are other better and safer sports on the Island of Taviuni. Taviuni boasts the one rival in the Pacific to the famous sliding rock of Samoa. I have tried them both with delight, and yield the palm to Taviuni. There is a regular cruising steamer from Suva and Levuku every two weeks - and this boat stops at Taviuni twice each cruise - so that either a day or a week may be spent upon this island where sliding over precipices is a pastime, and mountain climbing after the most wonderful orchids in the world, a lucrative occupation. From Korovu - the surf-board village - it is a ride of twelve miles to the sliding rock, which is much nearer - the village of Soma Soma, where the steamer usually makes a stay of several hours, quite long enough for a visit to the slide. Any native can guide you to the sliding rock; on the way he will, (if you wish, and care to take enough canned provisions for a picnic party) - gather up a number of maids and young men of Fiji - who have nothing to do most of the year round but sleep on their mats in doors or seek sport of some kind without - cricket being their favorite game. ... mountain side and suddenly a rocky gulch breaks upon the view. At its bottom, water is dashing with mill race speed. Down the gulch the whole mad party stumbles and falls, the women turning their backs at the water's edge to remove their upper garments and adjust their sulus, in which single width of wearing apparel they purpose to join the sliding party. Between rocky walls, a narrow stream of water comes pouring down through a winding trough of lava worn smooth by constant erosion. A native sits in the trough, the water behind him piles up in an instant, and he is propelled forward at a seemingly breakneck speed. In and out his body winds between the rocks, now following serpentine curves, now - darting straight ahead - then disappearing over the edge of a waterfall, emerging a second later from the depths of the pool below, then shooting forward into the next descending trough. Shrieks of laughter ascend from the young girls and they, too, seat themselves in the trough of the sliding rock, shot over falls and down through rapids - all shrieking and laughing with delight. It seems a dangerous sport, yet no one is hurt. I determined to try it. Gingerly I seated myself; the steep descent and jutting rocks before me made believe that only the natives have solved the secret of avoiding them; I attempted to rise, the water piling up behind me swept me forward feet foremost, and so in a sitting position I shot in and out between the high rocks on either side of me, and suddenly I was in the air. Shot over a waterfall, I landed in the pool below in a sitting position. Then I was upset forward, hurled into a narrow channel while my body glided over velvet rock. I went bumping over stones and rocks in a cararact, took another fearful dive and landed in smooth water in the midst of a circle of happy, laughing Fiji boys and girls. on the slimy, slippery bed of rock and keeping their balance as they sped along, until carried over the fall and alighting feet downward in the pool below. Sometimes three or four of us went down together, the first with his feet outstretched before him, the feet of the one behind under his arms, with his arms about his waist so we formed a train that dashed at express speed between the rock walls and is sent over the fall in a shrieking line of humanity that becomes instantly disorganized as it strikes the water below. It is sport for all the gods and goddesses of ancient or modern mythology. ... known to the tourist than is the slide in Fiji. I wandered out one steamer day and found a picnic party of a number of tourists and a dozen Samoan maids preparing for the great sport. The men - some of whom had brought their own wives - retired to a little native house and donned their bathing suits - one attempted to adjust a native lava-lava or loin cloth - with seeming success. The Samoan girls, as is their wont, merely turned their backs, discarded all upper clothing and adjusted their lava-lavas firmly. Then the procession wended its way down to the rock. The men with one accord paused before the rock; it , was thirty to forty feet high and over its smooth perpendicular face trickled several broad ribbons of water. One of the Samoan girls sat upon the edge of the cliff, straightened her body and shot down, descending into the deep pool at the base of the falls and rising from the waters to shake her hair and laugh loudly - an invitation to the others to follow. One more venturesome than the others did so. He sat upon the edge of the cliff, looked down, changed his mind, tried to get up, his feet slipped from under him and the next moment I was shooting through the air, my breath leaving my body; then there was a splash, a sensation as though I would never come up above water again - a coughing and spluttering, then a sound of laughter in my ears. The momentary thrill while falling those brief forty feet exceeds any sensation connected with the water slide at Taviuni, but there it lasts for minutes, while at Papasaia it is allover in a flash and a splash. The tourist with self-adjusted lava-lava was the next to attempt the slide, or fall; we finally left him in the pool searching with his feet for his lava-lava and not daring to come out in the presence of the ladies. The great sport is, of course, to show the novice how it is done. First a Samoan girl, full of laughter, sits on the edge of the precipice - the victim sits behind her: then an accomplice of the first girl sits behind him: suddenly there is a closing up of the ranks and the three go down together - the victim rises spluttering and bewildered, to the intense amusement of all. Sometimes there is a curtain lecture waiting the victim as he crawls out of the swimming pool. I saw one roundly lectured and marched away by an indignant wife who could not be made to understand the simplicity of the native Samoan sports. There are really three slides at Papasaia: First, the man's slide, already described; then a rod lower down the stream a little sliding drop of ten feet called the children's slide; then a third a few yards further, a steep but not a perpendicular drop, and this is the woman's slide. The picnickers, however, invariably begin with the sliding rock, and once the slide is taken, the sport becomes thoroughly enjoyable and the visiting parties that frequent Papasaia keep its fame before the world, and spread it still further abroad with every year that passes. N early all the South Sea Island sports are associated with the water - for, as in Samoa, the villages are usually built directly upon the seashore, or upon the banks of short navigable streams. ... two large islands, the one great sport is shooting the rapids in canoes. Some marvelous records have been made in tiny canoes down these racing, raging mountain torrents. Near Levuku, the old capital of Fiji, on the Island of Ovalau, I was introduced to the sport of shooting sharks. Near the town is the ahbatoir - the blood from the cattle flows into the sea and at high tide the sharks. attracted by the smell, come in droves - they swim within a few feet of the shore and persons wading in water knee deep have had their legs bitten off. The sport is to stand on the beach and shoot the sharks as they come sailing by. There is a great spluttering and throwing up of sand and as often as not Mr. Shark makes his escape into deep water. It is, however, more exciting sport, to my mind, than any shark hunting expedition I took part in with the Hawaiians. In Hawaii there was a time when the native would leap overboard armed only with a sheath knife and fight the largest sharks that frequent the waters about the islands. Nowadays, shark hunting is done by steam lauches. A white horse that has served its day is killed and anchored in shallow water until it is quite ripe, then some morning it is attached to the launch by ropes and towed out into deep water. The gleaming white of the carcass attracts the sharks, and they come - first one solitary fellow; he sniffs about the bait and goes away, soon to return, followed bv other sharks. Absolute silence is enjoined on the launch and the sharks take a bite at the bait, then swim quickly away. Soon, however, the taste of blood is in their mouth and they return - now they attack the carcass ravenously. Slowly the man on the launch hauls in on the bait line and silently the harpooner takes his position. As the carcass and the sharks come within striking distance he lets fly, and then everyone is at liberty to pepper away with rifles and revolvers; but the sharks are off, even the one that is harpooned, but if the line holds, he is soon wearied out and brought alongside to be despatched. If he should escape, there is no need to go shark hunting in that vincinity the next day. It is usually the pearl fishers of the South Sea Islands who find real sport in shark fighting nowdays in the APacific, and rtey fight when only attacked. At no time is shark hunting under the sea a sport for the white man. In the harbor of Apia the natives are fearless, but those ashore have witnessed horrible accidents to white swimmers. Not so long ago one of the young middies of a German man-of-war, taking his regular swimming lesson, with a rope about his waist, was attacked, the shark leaping out of the water after him when he was being hauled up. The Samoans go out, sometimes in light canoes, far from land, and remain over night in their search for the shark. They carry only a line of sennit, (made from the fibre of the cocoanut husk, and strong beyond belief) at the end of which they make a running noose, and a bit of bait which they dangle before the loop in the line. Soon Mr. Shark comes leisurely alongside and begins to sniff at the bait. If he does not put his head in the noose, one of the natives may slip it over his tail, and then there is a race to sea. Usually, however, the shark puts his head through the noose,which is tightened about his neck, there is a brief struggle before he is hauled alonside where a sharp blow from a club upon his snout gives him his last quietus. Seldom is it that the Samoan permit a shark to escape; he will even plunge into the water to fight one that is in danger of slipping out of the noose. Everywhere in the South Seas it was my delight to watch the islanders spear fish, and borrowing their long reeds tipped with a single needle of steel, seek to emulate their remarkable feats of skill - but with little success. In the clear limpid waters about the coral reefs. fish of gorgeous color may be seen swimming fathoms below the surface: in the shallower waters smaller fish are to be found, but there is none too small for the spear of the South Sea Island fisherman. ... impaled unerringly - in fact, even the small bovs are expert at this and spend much of their time ashore spearing small round sticks that are thrown along over the grass. It is a great sport, fish spearing, once the eye is trained and you learn the knack, but somehow I was only successful when I cast a five or six pronged spear into a school of fish that happened to be disporting themselves near the surface of the water - then I was sometimes successful. Spearing fish in the South Seas is not the most successful sport to be indulged in by the amateur. There is one South Sea Island sport, however, that the amateur may become proficient in almost at once - and that is turtle riding in the lagoons. Every native chief keeps his private turtle pond; in fact turtle meat is forbidden to the common people, unless especially presented to them by the chief. All turtles caught in the South Seas belong to the local chief, every white man of course, ranking with a chief. Put on your bathing suit and plunge into the lagoon where the turtles are kept within bound, seize a large one with the left hand just where the shell overlaps the head, place the left knee and the right and firmly on the turtIe's back and let the right leg remain stretched straight out behind you to steer with. The turtle will begin at once to make an attempt to escape. If he tries to dive lean back on your steed and pull upward with the left hand - this keeps his head above water - if your steed evinces a desire to go to the right, throw your loose leg to the left, until he is headed again in the direction you wish him to go. Within a few moments you have mastered the rudiments of ttlrtle riding - then for the race - some of the native boys will gladly join the sport, and for so long as you care to keep it up, you may race your steed around or across the lagoon at will. The speed of these animals through the water will astonish you, and it is highly proable that your turtle will be thoroughly exhausted before you tire of the sport. Turtle races are safe, for a little knowledge of the reach of the sharp hawk-like beak, will teach you the narrow circle that is "tabu," that is "sacred" to his lordship the turtle, and "forbidden" to you. It is safe to catch your turtle by the overlapping shell just above his head, and the rest is easy; mount quickly and a way you go - guide so that there is no collision with those with whom you race, and in a little while you may become as proficient a turtle jockey as the natives themselves. An American, I believe, was the first white man to bring turtle racing within the realm of the sports of the "Palangi" (white man) and for this he should have the thanks of everyone who visits the South Seas and enjoys the thrills of a sport that is new to him. Why the South Sea Islanders are so accustomed to aquatic and other sports that they have become a part of their everyday life, so that when you inform them they are sportsmen they are as surprised as Moliere's tradesman who at the age of fifty, learned to his astonishment, that he had been speaking prose all his life. The South Sea is the natural home of him who lives out-door sports. As for me I was loth to leave those waters that invite in a thousand ways to daily healthful exercise and games of chance with its finned inhabitants, that have about them just that tinge of danger that gives the glorious thrill we inseparably associate with all real "sport." Geoff Cater (2011) : H. F. Alexander : Water Sports of the South Sea Islands, 1911.